Exposure: Full sun to part shade in a location sheltered from wind. Bloom Time and Color: Salmon-peach flowers in late spring to late fall. Blooms repeatedly. 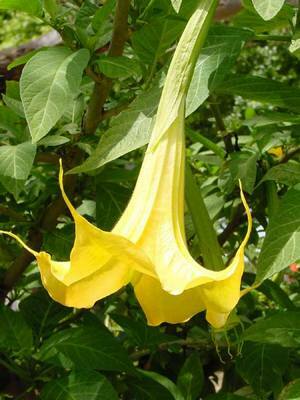 Description: Large trumpet shaped, fragrant flowers. South American shrubby tree like plant capable of achieving 30 ft in the wild. Impressive appearance. Spreads an exceptionally sweet, heady fragrance in evening.